Although products of the digestion of all three food types – carbohydrates, proteins and lipids – all follow some common pathways for energy conversion, one usually attacks this subject by considering carbohydrate digestion, as this allows a linear presentation of the entire sequence – glycolysis, rhe Krebs cycle and chemiosmotic phosphorylation (the electron transport chain). Afterwards, we will consider how the other two types enter into the same processes. where the energy is principally stored in molecules of ATP, the body’s “energy currency”. ATP serves as a transport agent, carrying the energy from mitochondria to elsewhere in the cells, which need it in order to function. oxidative phosphorylation (the electron transport chain). make the activation energy necessary for each step small enough to be adequately lowered by an appropriate enzyme. Each step of this pathway (and all the others) is brought about by an enzyme.The following table indicates the steps of glycolysis in some detail. Step (6) is important for two reasons. First, it is the one where the Pi necessary to convert ADP into ATP comes into the action. After step (6), the Pi is no longer free and the conversion is now energetically favorable and takes place in the step (7). A similar step produces another pair of ATP molecules in step (10). Step (6) also includes the reduction of NAD+, whereby it collects electrons which it will carry to oxidative phosphorylation.. The glycolysis pathway is used by almost every organism on Earth, including prokaryotes, so it must have evolved very early in the history of life. Notice that glycolysis does not require oxygen in order to proceed; it is an example of anaerobic respiration. Ignoring those complex chemical names, the table shows that each step is chaperoned, so to speak, by a different enzyme. It also shows that although the overall process is to convert glucose to pyruvate, it requires two ATP to get started (input column) but produces four (output column), for a net gain of two ATP. finally, coenzyme-A is added to produce acetyl-CoA, which enters the Krebs cycle. This is shown at the top of the following figure. This step has been referred to variously as the linking step, the grooming step or the bridging step, but I prefer the preparation step – or prep step. The citrate synthase enzyme (always enzymes) joins the 2-carbon acetyl-CoA with a 4-carbon molecule of oxaloacetate to form a 6-carbon molecule, citrate (or citric acid, hence one of the names of the cycle). As it traverses the cycle, this molecule will lose carbon atoms to become once again a 4-carbon oxaloacetate molecule, which can start the cycle over again with the addition of some acetyl-CoA. But along the way, Good Things will be produced. Another enzyme, aconitase, converts citrate into isocitrate by a “simple” rearrangement of its bonds. A further enzyme, isocitrate dehydrogenase, oxidizes isocitrate into 5-carbon α‑ketoglutarate.[ref]Gulp! [/ref] Carbon is released as CO2 and electrons serve to reduce NAD+ to NADH + H+, with a gain of one NADH + H+. Yet another enzyme α‑ketoglutarate dehydrogenase converts α‑ketoglutarate into 4-carbon succynal CoA. Once again, CO2 is released and oxidized electrons reduce NAD+ to NADH + H+, for a gain of one more NADH + H+. The enzyme succynal CoA dehydrogenase converts succynal CoA into succinate. This reaction is exergonic and the released energy serves to form GTP, guanosine triphosphate, similar to ATP, which in turn furnishes energy to convert ADP into ATP. A different enzyme would produce ATP directly. That makes a gain of one ATP. Succinate dehydrogenase converts succinate into fumarate. The oxidized electrons are passed to the electron carrier FAD which is reduced to FADH2, so there is a gain of one FADH2. Fumarase catalyzes the addition of a water molecule to fumarate to form malate. Malate dehydrogenase oxidizes malate back to oxaloacetate (back to step 1). The electrons reduce NAD+ to NADH + H+, so one more NADH + H+ is gained. Note that one glucose molecule makes two pyruvates and so brings about two “turns” of the Krebs cycle. The oxidation steps in one cycle result in a gain of three NADH + H+, one FADH2 and one ATP. The Krebs cycle may be a great advantage over glycolysis in terms of efficiency of ATP production, but the electron transport chain (ETC), where oxidative phosphorylation takes place, has them both beat hollow. [ref]When I first read about it, I was giggling with joy. 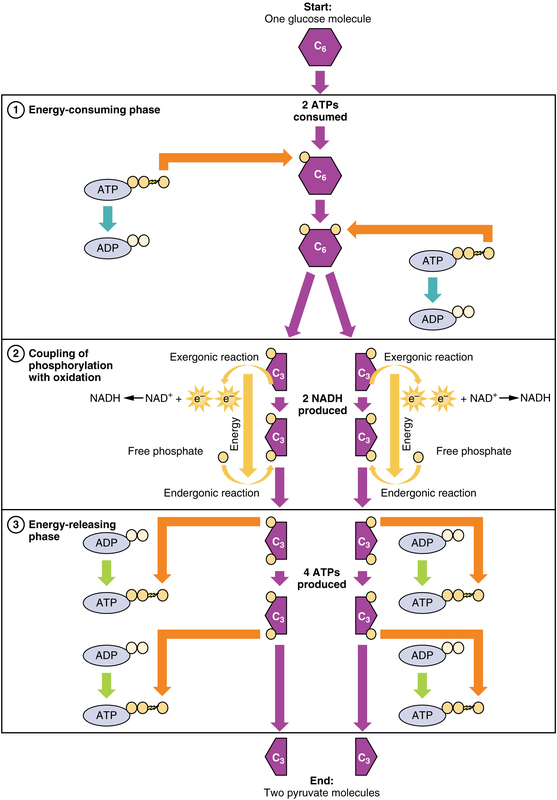 [/ref] Oxidative phosphorylation takes the electrons carried by NADH and FADH2 produced in the Krebs cycle and uses them to produce more ATP – much more. and leaving them off as they are oxidized to NAD+ and FAD in the opposite reactions (just invert the arrows). In the electron transport chain the NADH and FADH2 produced in the Krebs cycle, with the help of two coenzymes, transport electrons to the first of a series of four enzyme complexes in the inner mitochondrion membrane. Each complex is reduced as it receives an electron and oxidized as it passes it on to the next complex, somewhat like a bucket brigade (or a relay race). The electron is passed along because each successive complex is more electronegative (electron loving) than the preceding one. (One also says it goes from a complex of higher reducing potential to a lower one.) The energy produced by the redox reactions at each complex serves to pump protons across the inner mitochondrial membrane into the inter-membrane matrix. At the end, the electrons are passed to oxygen which uses them to combine with the residual hydrogen to produce water. 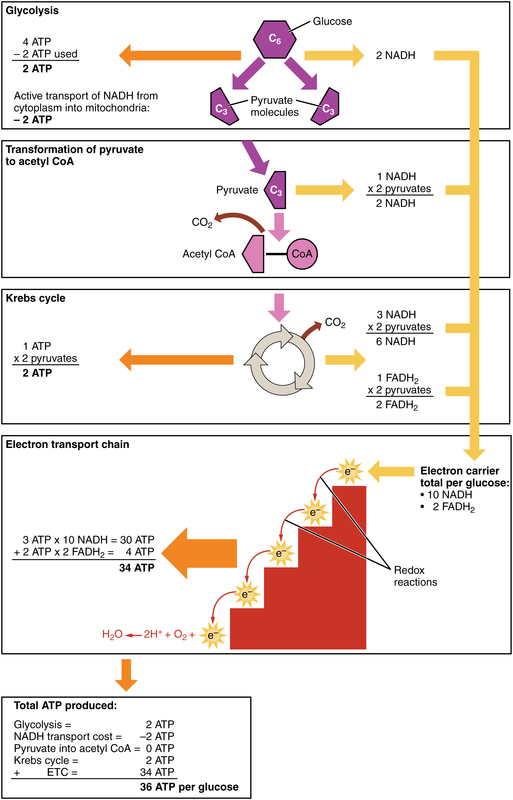 The left-over re-oxidized NAD+ and FAD can return to glycolysis and the Krebs cycle to pick up more electrons. In summary, the overall function of the ETC Is to use the energy of electrons from reduced NADH and FADH2 to pump H+ across the inner mitochondrial membrane into the inter-membrane matrix so that the built-up electrical potential can power the synthesis of ATP by ATP synthase. 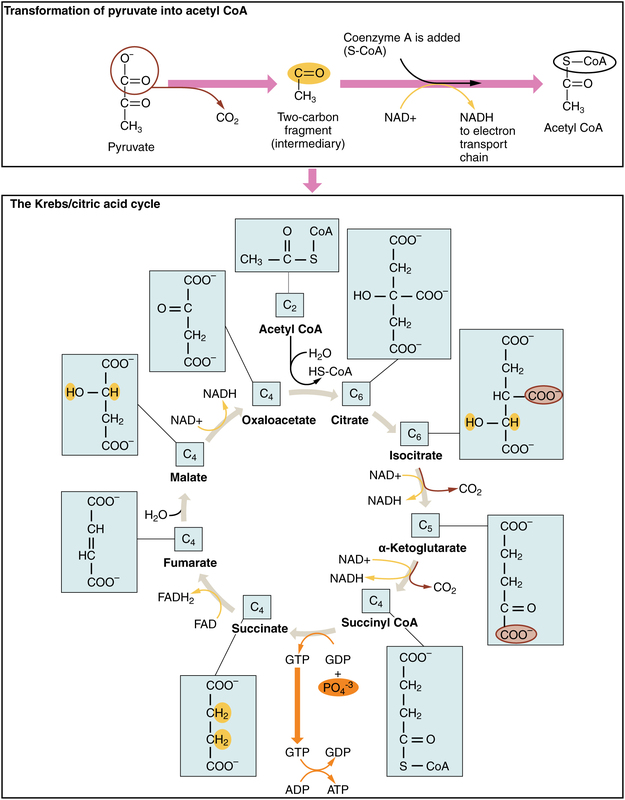 Look at cellular respiration with the accounting data added as in the following figure The accounting is clear. Oxidative phosphorylation can produce up to 34 ATP molecules per glucose molecule entering the glycolysis pathway, for a total of 36 ATP in cellular respiration. This is where we get most of our energy. The system exists in one form or another in all eukaryotes and serves also in photosynthesis in plants to make the energy necessary for producing glucose. The process can be broken down into the electron transport chain (ETC), the four complexes on the left in the following figure, and ATP Synthase, the red complex on the right. We will ignore the details of the many redox reactions taking place in each complex. Consider the electrons transported to the ETC by one NADH. Note that only complexes 1, 3 and 4 pump protons across the membrane. Complex 1 accepts electrons from NADH, complex 2, from FADH2. One NADH is oxidized by complex 1 (C1), NADH dehydrogenase, to give up two e– and one H+. For each electron, two H+ are pumped from the matrix across the inner membrane. Various reactions take place within the complex, but we will treat it as a black box. Both e– are transferred to ubiquinone (or coenzyme Q), a mobile transfer molecule. CoQ is hydrophobic and so can move about within the membrane, by which means it delivers the e– to complex C3, cytochrome b-c1, bypassing complex 2. The e– are passed one at a time to cytochrome c (another mobile transfer molecule). For each e– accepted by cytochrome c, two more H+ are pumped across the inner membrane. Again, more is taking place than meets the eye. 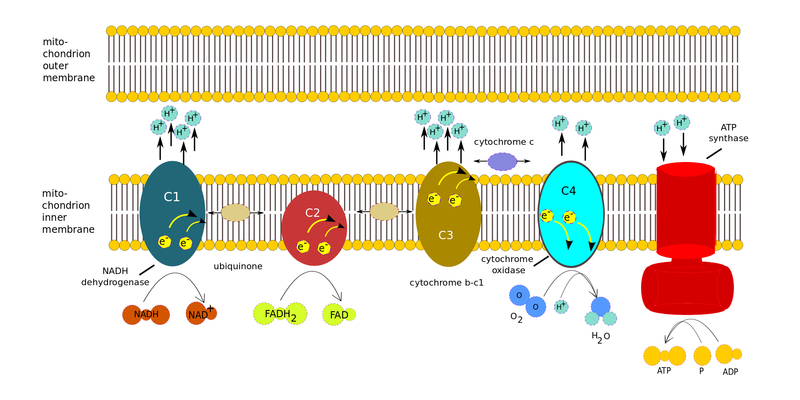 Cytochrome c moves back and forth along the inner side of the inner membrane and so delivers the e– one at a time to complex C4, cytochrome c oxidase. When C4 has received four e–, it can use them to reduce an oxygen molecule, which is therefore the last electron acceptor in the chain: The four e–, four H+ and the O2 form two water molecules, while four H+ are pumped across the membrane into the inter-membrane space..
As shown in the figure, FADH2 delivers its e– directly to complex C2, which does not pump H+. The e– are passed to CoQ and then follow the same path as the other e-. The electric potential brought about by the H+ inside the cell membrane drives them across the membrane through the ATP Synthase, as the membrane itself is impervious to H+. Three H+ are necessary to make one molecule of ATP. Many such chains exist in every mitochondrion’s inner membrane, so multiple H+ pumps are running all the time, converting glucose and oxygen into energy stored in ATP. We have considered glycolysis, the Krebs cycle and the ETC as components of the carbohydrate metabolic pathway. But we can also get energy from lipids and proteins using parts of the same pathway. In a recent episode, we left lipids inside chylomicrons or other lipoproteins in the blood, or in the liver or muscles. In order to use lipids for energy, triglycerides in the liver or muscle are converted by lipolysis to glycerol and fatty acyl CoA. Acyl CoA is then carried by carnitine into the mitochondria of the cells, where, it is converted back to fatty acids, which are degraded by the cyclic process of β-oxidation. Each loop of this process converts a two-carbon segment into acetyl-CoA, shortening the chain by two carbon atoms at each cycle. The acetyl-CoA enters directly into the Krebs cycle of cellular respiration, bypassing the glycolysis stage necessary for glucose. Since the products of the Krebs cycle also feed the electron transport chain, converted lipids can furnish a lot of energy. Compared to carbohydrates and proteins, triglycerides can furnish more than twice the energy per unit mass. So when glucose levels become inadequate, triglycerides stored in the liver or muscle are hydrolyzed to fatty acids which, again, must be transported through the blood, this time by albumins, globular proteins in the plasma. The rate of conversion and transport of fatty acids is great enough that they can be oxidized to fulfill almost all the body’s energy needs without the need of energy from carbohydrates. Most cells except brain tissue and red blood cells can get their energy from fatty acids – as long as they last. The liver stores a large quantity of fatty acids, but uses only a small part of these for its own energy requirements. So when carbohydrate stores (including glycogen) are low, great use is made of fats for energy. But, due to lack of intermediary substances, the Krebs cycle slows down. Excess acetyl-CoA accumulates in the liver, where it is combined in pairs to form acetoacetic acid which is then carried by the blood to other cells. Some of it is converted to β-hydroxybutyrate and acetone, large quantities of which can be transported rapidly to cells. [ref]Differences between Guyton and Hall and Openstax about the order of these two processes. Which came first, acetoacetic acid or β-hydroxybutyrate and acetone? The end result is the same. [/ref] These two substances plus acetoacetic acid are collectively referred to as ketone bodies and their synthesis from fats is called ketogenesis. On arriving in cells, all three are converted back into acetyl-CoA, which enters the Krebs cycle. This Is interesting because, in such circumstances, the brain may lack energy because fats can not cross the blood-brain barrier to supply it. But ketone bodies can. So the brain goes from glucose input to ketone bodies without ever using fats. In fact, ketone bodies are produced all the time, even in a healthy body. They are not bodies, but water-soluble liquids. They are so named because one of them is acetone. In brief, fats stored as triglycerides in the liver may be modified to ketone bodies and enter cells where they are transformed into acetyl-CoA and enter the Krebs cycle, including in the brain. Proteins can also contribute to energy production. While some amino acids are used to re-form proteins (biosynthesis via gene expression) which are then used or stored, some remain. Most of these are converted by deamination, removal of amino groups (-NH2) from the acids, a process occuring almost entirely in the liver. Most of the time, the amino group is transferred to α-ketoglutanate, which thereby becomes an amino acid, glutamate. A >C=O group from the α-ketoglutanate replaces the original amino group, converting the amino acid into a keto acid. So the transfer is really transamination. Here is the interesting part. The amino acid alanine is transaminated to pyruvate; aspartate, to oxaloacetate; and almost all the others, to molecules (pyruvate, acetoacetyl CoA, fumarate, succinyl CoA, oxaloacetate and α-ketoglutamate) which figure somewhere in the Krebs cycle. So all our major nutrients wind up sooner or later participating in the Krebs cycle to make ATP.1 The number of ATP molecules obtained from a gram of oxidized protein is slightly less than that from a gram of oxidized glucose. In order to avoid its poisoning us, ammonia left over from deamination must be removed and this is carried out by the Urea cycle. 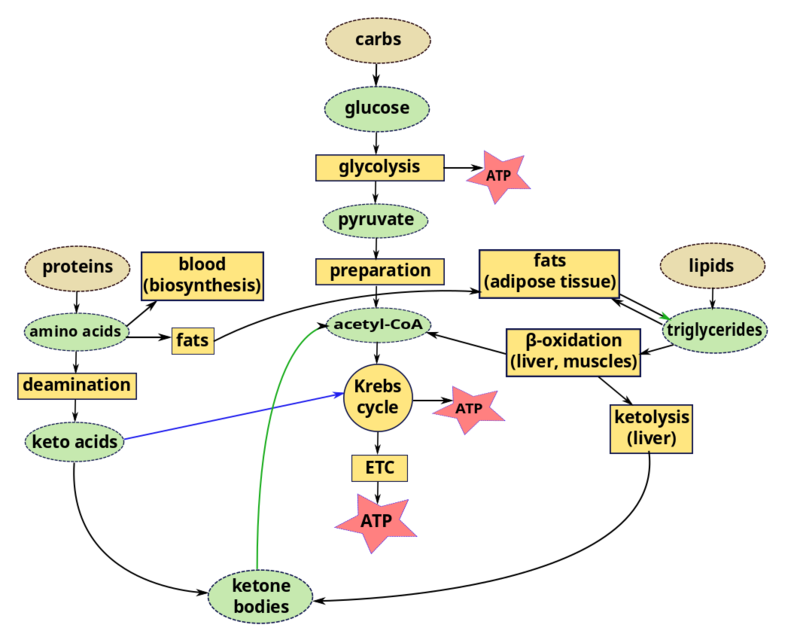 Some of the keto acids can be modified to enter the Krebs cycle, like glucose or glucose products, and so are called glucogenic; others form ketone bodies (ketogenesis) and are called ketogenic. So ketone bodies may be the product of lipids or proteins. Excess protein can turn to fat, too. If more protein than can be used for amino acids is consumed, much of the excess is converted and stored as fat or glycogen (gluconeogenesis). From here on, it follows the course of any other fat or glycogen. The preferred order of nutrients for energy is simple: Carbohydrates come first. But even the glycogen stored mainly in the liver can only furnish the body in fuel for maybe a half day. If carbohydrates run out, fats and proteins start to be used, principally fats. Use of fats continues approximately linearly until they run out. At the same time, stored amino acids are converted by gluconeogenesis to glucose. When the easily-accessed amino-acid store is reduced, fat usage increases and some of this is converted to ketone bodies, which can enter the brain and supply energy to it. However, changing from a carbohydrate-rich to a fat diet may require several weeks for brain cells to switch to obtaining up to 75% of their energy from fats (via ketone bodies). We have seen that excess carbohydrates can be transformed into fat. Although such fats from carbohydrates also can be converted to acetyl-CoA to make energy, they can never be converted back into carbohydrates. As its name implies, oxidative phosphorylation is an aerobic pathway, requiring oxygen. The electron transport chain requires oxygen for the penultimate step of adding H+ ions to O2 to make water. In the absence of oxygen, this cannot take place. If oxygen is lacking, energy must be obtained differently. Glycolysis requires no oxygen other than what is present in the initial reactants and therefore is a form of anaerobic respiration. In case of rapid, intense energy consumption by muscles, the need may be fulfilled by glycolysis, which is much faster than the Krebs cycle, but can furnish energy for only about 15 seconds. Then another energy source must be found. There is another, much less efficient means of creating energy from pyruvate by anaerobic respiration – fermentation. One sort of fermentation exists within the body; the other, in yeasts (in bread or beer, for instance). When oxygen is limited, lactic acid fermentation can take place.. Enzymes use electrons from NADH to reduce the pyruvate to lactic acid plus a small amount of energy. In particular, muscle cells can can do this in order to get fast (but relatively little) energy, releasing the lactic acid into the muscles. The oxidized NADH (now NAD+) can now be recycled to glycolysis. In bread or beer, ethanol fermentation takes place. Enzymes bring about the decarboxylation of pyruvate to acetaldehyde, releasing CO2 which makes the bubbles in beer or bread. Then enzymes use electrons from NADH to reduce acetaldehyde to ethanol. The ethanol evaporates when cooking bread, but is carefully conserved in the making of beer or wine. The liver converts glucose into glycogen and stores that; it can be reconverted whenever the level of blood sugar becomes low. This function is mediated by the hormones insulin and glucagon, both produced by the pancreas but having opposite effects. Glucose concentration in the blood needs to be within a certain limited range in order to distribute enough energy to the body, but not so much as would harm organs and tissues, especially where blood vessels are tiny, as in the retina, the body’s extremities and the kidneys. Most cells have receptors which bind insulin, causing glucose transporters in the cell membranes to allow more glucose to enter the cell for storage, thereby reducing the glucose level of the blood. Abnormally high glucose levels in the blood are a sign of diabetes, which can be due to inadequate insulin production or to the cells’ not reacting correctly to insulin presence. If the blood glucose level becomes too low, the pancreas secretes glucagon which stimulates production of glucose from the breakdown of glycogen, from amino acids or from stored triglycerides (lipolysis). To see how this energy is used, proceed to the chapter on muscles.